I sat in the back of a vintage fire truck from the 1930’s watching my son and other children beaming with mouths open like golden retriever puppies. We drove down the main cobblestone streets and by the beaches and exclusive Cliff Road area of Nantucket Island. The kids were determined to pull a rope that rang the truck’s rusted silver bell at every person they saw: the contractors and landscapers preparing second (or third and fourth) homes of the one-percenters and town residents draping their cars, storefronts, and homes in daffodils for the approaching Spring festival. Everything about this ride had the fingerprints of the owners of the Nantucket Hotel on it. The Nantucket Hotel and Resort looks like an inn from the street, but it isn’t. 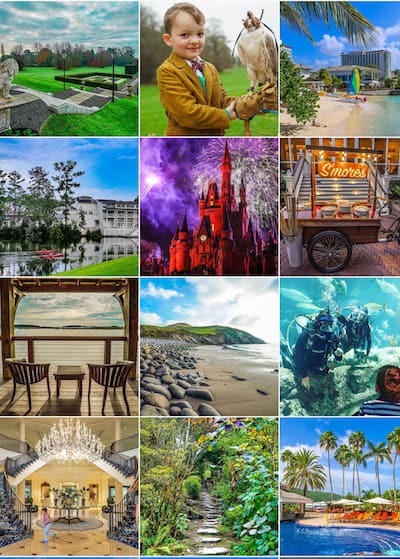 And when you see the Sniders, the owners, walking around the front lobby, engaging with the staff and guests, you would think they were innkeepers, but they’re not. If every New England innkeeper came from a family construction and design company with the same aesthetic pedigree of the Sniders, cramped rooms with ugly floral wallpaper and lace bed skirts would not exist east of the New York state line. Mark and Gwenn Snider have three children themselves, not quite empty-nesters, and still know what parents need in a vacation. 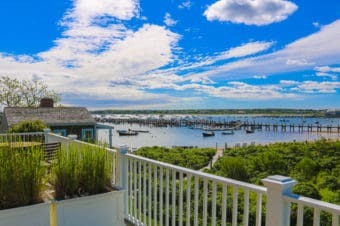 The Nantucket Hotel and Resort offers many amenities that make or break family comfort and fun: large rooms and suite accommodations with mini or full kitchens, swimming pools, a kid’s club with supervised programming, nightly s’mores, and more. Mark has a passion for all things transportation, so in addition to the vintage fire truck ride that your kids will never forget, you can thank him for the best island welcome on wheels. Jamie, the hotel manager, picks guests up at the ferry in a 1938 bus that lets you know you are about to have some serious fun. The vintage bus horn, which he beeps a lot, sounds like Jed Clampett is approaching. Jamie is so sincere, he seemed like he was welcoming us to his home. I’ll attribute his mellow demeanor to his background running luxury properties in the Caribbean like the Nesbit Plantation and the Ritz-Carlton, St. Thomas. He offers daily rides in the fire truck. Whether he or the kids have more fun, I cannot say. The lobby of the hotel is small with an open floor plan, a well-stocked boutique, a DVD library, and a refreshment table serving coffee or lemonade. 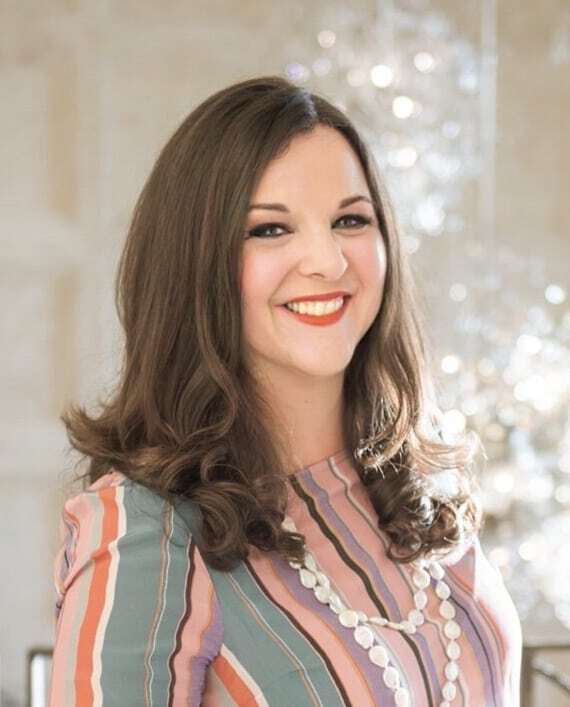 Gwenn is the daughter of an artist and has a keen eye for interesting pieces herself. A Sam Ostroff-Bruce Rosenbaum punkwhale sculpture above the front desk greets you and takes your picture while monitoring the front lobby. This is just another example of a couple that wants to create a singular and whimsical environment. Wired into an antique compass binnacle, a red button that could launch the atomic bomb in a B-grade spy movie makes Punky the Whale wag his tail and chomp his teeth. The basement has a large children’s playroom with supervised programming, pool and game tables, and the island’s largest health club. We were down there a lot because my kids kept asking to return, probably to see the Ritz cracker world clock art hanging in the stairwell. There is a heated family pool with a cleverly attached kiddie pool, and an adult-only pool is directly accessible from the health club. While there is no spa, the hotel offers massage services. Complimentary continental breakfast is included in the room rate at the restaurant Breeze, except for during the summer season. The buffet had hard-boiled eggs and yogurts in addition to all of the various carbs, as well as iPads loaded with newspaper apps. The dinner we had at Breeze Bar and Cafe was outstanding. I had a seafood risotto with fresh spring peas that I would have happily eaten every night that week, and my husband’s salmon with enoki mushrooms was also excellent. Breeze just acquired new chef Josh Schoen from the Sniders’ other resort on Martha’s Vineyard, the Winnetu near Edgartown. The decor of Breeze Bar and Cafe is equally appealing. The focal point is a scale model of the Sankaty, a ferry that transported visitors to Martha’s Vineyard and Nantucket from 1911 until 1924, suspended from a stunning blue ceiling. Mark, the owner, relayed the history of the Sankaty to me with a genuine passion for the islands’ histories and his reason for commissioning the model. The hotel first opened in 1891 under the name the Point Breeze. The Sniders purchased the historic hotel in one of the greatest real estate stories I have ever read. An effort to make luxury condos out of the Point Breeze failed with the market collapses of 2008, and that developer was in contentious, well-publicized bankruptcy battle with local contractors. TD Bank seized the property and was unable to sell it for years at $12 million. This term in real estate is called a White Elephant, which is, strangely, the name of the well-known luxury hotel across the street. The Sniders bought the hotel for an unbelievable price of $2.8 million and closed in January of 2012. They brought in all of their construction company expertise and renovated and opened the hotel in June of 2012. The Sniders are mindful of bringing good karma to the hotel, and it is working. By keeping the property open year-round, it has now become a staple in the community. I learned the hotel even offers island residents frequent promotions to stay for free during slower seasons if they enjoy a meal at Breeze. That’s much more effective than burning sage in each room. A painting by Gwenn Snider’s mother hangs in the lobby. Breeze Restaurant has lots of outdoor lounge space. The rooms are all suites, with some as large as four bedrooms. Our one-bedroom Mizzenmast Suite was generous in size and the perfect balance of family-friendly and modern-beach-casual. Blue whales dominate all motifs at the resort, and there were several in our room: on pillows, on walls, and squirting ones in the bathtub. There were several closets, a full kitchen, and lots of room to play and rest. The closet contained beach chairs and towels for the resorts’ frequent bus rides to Children’s and Jetties Beaches. More cottages opened this spring on the far side of the swimming pool. On one of the cooler spring nights, we discovered a Lady & the Tramp DVD left by a former guest from the resort’s extensive movie library and chose to stay in. As we settled, I was really craving some sort of salty snack after the s’mores at the fire pit, but I wasn’t sure what the hotel would have. (They don’t have room service.) I called, and the front desk agent quickly delivered popcorn for our movie night. Everything about this place for families is just easy. There is even a sign indicating no bed jumping after 9pm. All bets are off at 8:30, though. The kid’s club was staffed with extra hands to accommodate the Daffodil Festival crowds. My daughter ran in and found children of all ages to play with and started leading a game of four corners while we chose a quiet morning to pack and read the paper. When we came to collect them, they hadn’t seen us and were quite content. We decided to linger outside and play a game of pool ourselves. No monkeys jumping on the bed after 9PM. After storing our bags, we saved the grand finale of the fire truck ride and loaded in, making friends with the other family, and sharing the permanent smiles of our kids as we toured the beaches. As we drove down Main Street, everyone waved at our own little parade while setting up for the big weekend—when most restaurants and stores open for the season. Jamie said he would be glad to deliver our bags to the ferry to let us explore the town. This was an incredibly convenient option for us to make the most of our last day. We grabbed two bottles of fresh juice after exploring. “That will be $28.” My husband and I both raised our eyebrows. “They are pressed locally each morning,” we were told with more than a little condescension and a subtle eye roll. Fell asleep in the lobby, eating a cookie, at the Nantucket Hotel. Jamie and the hotel bus arrived with our bags, and we said our good-byes. He turned around and held up his hotel sign and grabbed the new crowd arriving on the ferry. I felt pangs of jealously at those people as I watched the bus pull away. My first trip to Nantucket wasn’t long enough, and I knew we would be returning to the Nantucket Hotel again soon. It was such a unique hybrid of a boutique hotel with resort-like amenities for families—a combination I would love for the owners to replicate all over New England. I would enjoy a fire truck ride around Newport, Portsmouth, Woodstock, and Portland, too. 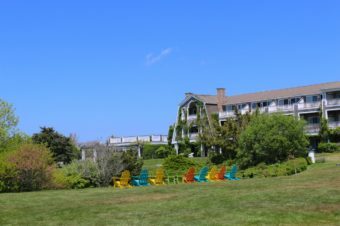 We were guests of the Nantucket Hotel & Resort, but the opinions expressed in this article are my own. 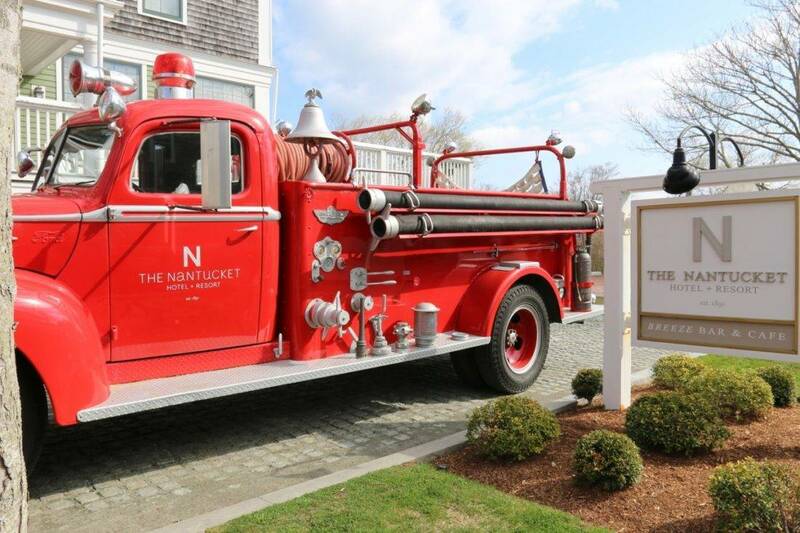 I’ve always wanted to visit Nantucket and this is a beautiful hotel. I imagined hotels in Nantucket looking JUST like this! To think that they have a kids area that big for the smaller size that they are…impressive! Doubly so is their smart business mind to do free stays for dinner. Kudos to them! I’m so glad to read this! Nantucket has been on our list of “Must Visit” for years, and it’s so crazy that I haven’t gone, despite being a 33-year-old Bostonian and travel blogger. Now that we know where to stay, we’ve got to go! Absolutely gorgeous place. Any beach place gets my vote – not to mention the food! What an extraordinary place – I’d LOVE to visit! It looks so very beautiful – and welcoming. What an amazing property! I’d love to visit Nantucket some time.